And double LOL that he effectively lost the contest. I assume that this is Michael Christians doing? He has to go before he embarrasses himself any further. I can’t understand how he reached that conclusion. Shoulder to the head and wasn’t directly contesting the ball at the time. I saw it (the vid) not long after it occurred and thought at the time Hogan might be in trouble. 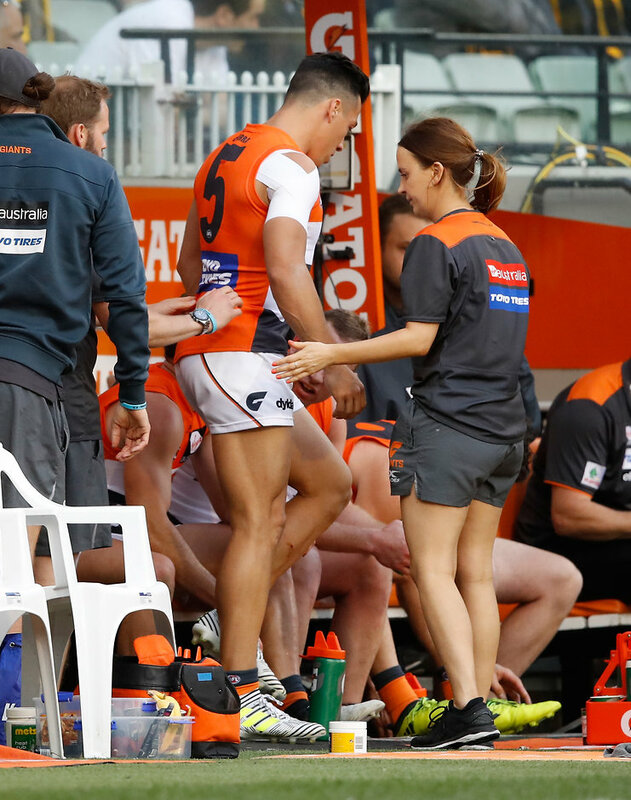 Dunno what the medico report said but Brown went off after that and did a concussion test so a minor sanction isn’t the worst outcome, though a free for high contact at the time was likely most suitable. Yep. Thought it was pretty clear why. Head is sacrosanct. If he had been concussed, it would have been weeks. They are contesting the ball so that shouldn’t be the issue. For ind it’s incidental contact and the fact that it has been cited just leaves a whole lot of incidence throughout a match open to interpretation. Another 5 years and the players will be playing tag. Every single clearance would have this. Edit: JFC…you report this, you’re reporting 5-10 players per game. Hogan’s running directly at the ball, stood up, Brown decides to try and take him off his line, and runs his head into Hogan’s shoulder. It shouldn’t be Hogan’s responsibility to worry about where Brown’s putting his head. Goes the player instead of the ball. Buckles the shoulder to bump said player, … gets him in the head. Damage could have been a lot worse. By… running in a straight line at the footy, and bracing when Brown comes at him? Who is leaning in on that picture? I could walk up and headbutt the interchange bench and the bench would get fined, under this “interpretation”. running in a straight line at the footy, and bracing when Brown comes at him? lol. If that’s what you genuinely see in that vid, I want some of what you’re smokin. Goes the player instead of the ball. Buckles the shoulder to bump said player, … gets him in the head. 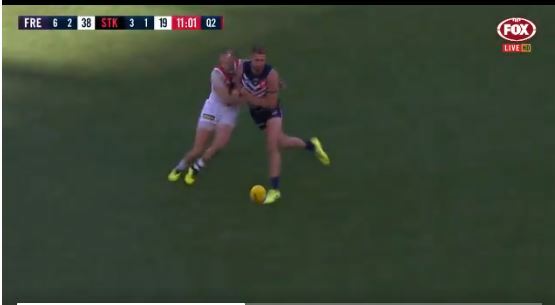 Doesn’t seem that different to the Cotchin incident from a couple of years ago except Sheil was concussed and ruled out of the game at quarter time in a Prelim. He deviated a touch. It’s irrelevant though, he’s perfectly entitled to use his body to protect his space. That’s part of football, and happens dozens of times a game. Is he meant to change what he’s doing because Brown’s lead with the noggin? That’s clearly very stupid, and the implications don’t bear thinking about. What you call “Leading with the Head” I call going for the agate, he only has eyes for the pill. Hogan takes his eyes off the ball, deviates towards the man, and CHOOSES (key) to bump. If he doesn’t get him high. with a shoulder to the head, it’s not an issue. But we’ve heard that (bolded) definition stated multiple times in the past 2 years, and it’s virtually always a charge, and I don’t have a problem here, I think it fits it perfectly. It’s all about protecting the head, stopping concussions, and trying to persaude Soccer Mums not to fear their boys playing Aussie Rules, and they are unrelentent on it. If you choose to bump, and get a bloke in the head, you’re gone. He’s leaning to the left to try and win a ball in front of him? Two guys running towards a contested ball. One leans into contact head first. What’s the other guy meant to do? He can’t tackle. He can’t get down low, now. So he just has to stop? Get out of the way of his head! Also, doesn’t have his hands down. Is not going for the ball. You 2 are gonna have to find some way to argue with each other from here on. I’m out.